The other day I opened my Kindle to see the operating software had been updated. That was surely a good thing, as they said the update improved the way the text was rendered, wasn’t it? Then it crossed my mind that any changes might render my carefully balanced and developed format differently, spoiling my book. And, surely enough, my worst fears had come horribly true. Well, not seriously but definitely annoyingly. The displayed quotations were now the same size as the main text. The inability of the device to recognise the margin-right property (or, indeed the margin-top property for that matter) meant that I had decided to represent displayed quotations by setting the font-size property to 0.9em. To my horror, these were now rounded up to 1.0em and were indistinguishable from normal text except for being set-off with white space before and after. Puzzlingly my small-caps solution was working, and that was implemented the same way, or so I thought. Careful examination of the style-sheet revealed that the style for small caps used a font-size of 0.85em. Changing the style for displayed quotations fixed the problem, albeit now showing the quoted material 0.5em smaller than I had originally intended.If I measure it carefully, I suspect I’ll find it’s been rounded down to 0.8em. Now off to find out how to update the file, now with ‘version 1.1’ on the title page verso. Amazon says to contact them if an updated file is to be provided and they will be able to allow purchasers to update their e-book by going back to their website, but only after a four week delay. I chose the quicker route and just overwrote the file by re-uploading it, as they said. That effectively re-published the file and it is now ‘under review’. Worse, when I clicked the link for further information, it said updating an existing publication would be slower than uploading a new one. However the reality was slightly different. What actually happened was that even though my e-book was showing as ‘under review’, the original listing was still ‘live’ on the Kindlestore. Now after a day everything is fine, the new version 1.1 is live and has seamlessly replaced to old one. Well, Amazon finally got something right! On a different note, I received notification of two advance orders from Bertrams Book Distributors for no less than THREE copies of the paperback. That perplexed me, as the listing on Nielsens database cleary states it is not published until 20 August. Bertrams tell me it’s not unknown for someone aware of my book’s impending publication to get impatient and place an order for an advance copy. Nice to know there are people out there THAT eager to get their hands on a copy! Speaking of which, how eager are YOU to get a FREE copy? I just gave away the third free copy to Don Lockwood, who sent me a Facebook friend request. If you have followed me on twitter, thank you, and just a gentle reminder that each time you RETWEET one of my tweets you get ANOTHER chance to win the FOURTH FREE COPY to be given away on Tuesday, 31 July, 2012. Just click on the yellow panel just below the book jacket opposite to find out how. At the far end of Greenland Dock, in Rotherhithe, London, nestling away almost hidden behind the warehouse conversion along a narrow alley called ‘Randal’s Rents’ lies a big pub called the Ship and Whale. And it is one of the most important settings in my novel, Bokassa’s Last Apostle. This pub was the longest continuously gay pub in London, until it was tragically turned straight in the late nineties (if my memory serves me right). 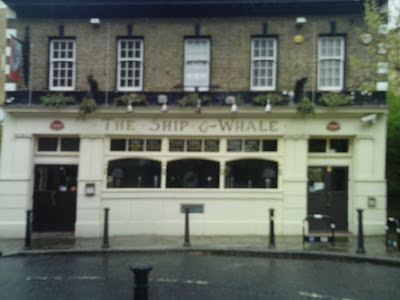 According to Dockyard Doris, in a conversation I had with her – inside the Ship and Whale as it turns out – she opened it as a gay venue back in the fifties. Before that it had been a brothel. This was back in the days when ‘the island’ as the area was called was pretty much a no-go area, cut off from the rest of London by the derelict Surrey Commercial Docks and riddled with gangsters. So it was a natural place for Everton’s father to hide from Bokassa in my novel. I have rather shamelessly modelled a drag queen whom I’ve named ‘Tomatina’ on Dockyard Doris. The boys run into her at a drag club called ‘The Way Out Club’ which is hidden away behind Tower Gateway station, and she tells them all about it. But I won’t spoil the plot by going on about it here. (Incidentally, I have resisted the temptation to use the curious fact I ran across that there is a street ‘festival’ in Spain called ‘Tomatina’, where the participants throw tomatoes at each other.) Apparently, according to Doris, one day she was playing there when a charabang full of pensioners came in, unaware it was a gay pub. Apparently they absolutely loved her act! The pub was one of my regular hang-outs in the nineties. It benefitted from a late license, staying open until 2am well before the drinking laws were relaxed. It only managed this by closing the doors at midnight. How many times have I had to call them an be sneaked in via the kitchen! My brother lived in one of the docklands apartments a short walk away, and was completely unaware there actually was a pub there. He even took some of his straight friends there, although they were a bit nervous of visiting the gents. I subsequently moved to New Cross and frequently walked back through a back way in the small hours of the morning after the tube had closed down. The structure of the building was unsound and, eventually, the brewery had to do something about it. In order to offset the enormous cost of the work, they had to convert the roomy upstairs staff accommodation into flats and surrendered their late licence because of the residents upstairs. In the process they decided it would re-open as a straight bar. It used to be really cruisy, with a central bar across which it was easy to give the eager eye to someone on the other side, whilst you could have a civilised conversation with fellow drinkers just as well. At one side, there was a dance floor. It was a comfortable place to be, and the atmosphere was made more cruisy by the black wooden floor and painted out windows. To further ruin the atmosphere and to ensure the gay clientèle didn’t return, they laid a floral carpet, moved the bar to the side and opened out the windows. The place feel completely dead now. It was an act of cultural vandalism to turn it over to straight people. 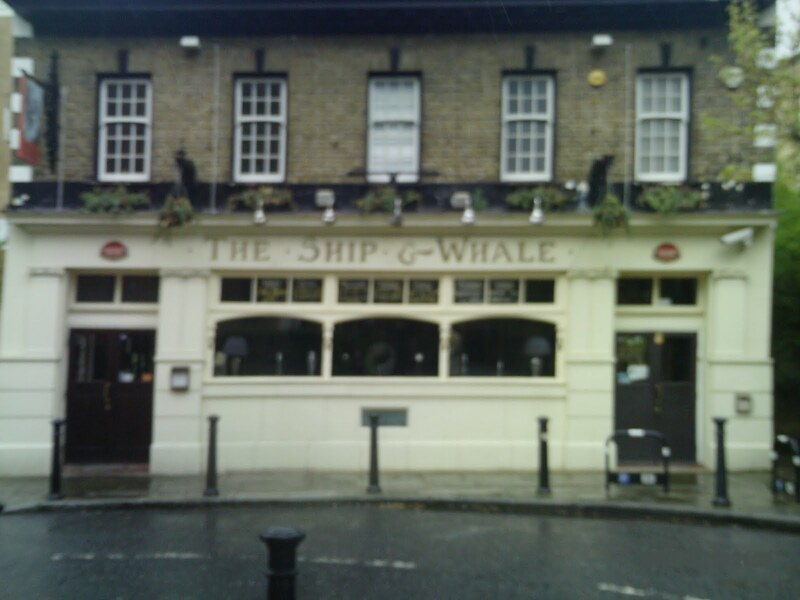 More about the Ship and Whale in a forthcoming blog about the Pepys estate. The files for my novel Bokassa’s Last Apostle is now with the printer, resplendently adorned with seven juicy quotes from my reviewers. In the process of editing it, I managed to tidy up the chapters so they mostly filled the last page with print. This meant making just a few tiny edits to paragraphs with only a few words on the last line. Hidden away in the text there are eight strategically placed hyphens breaking words at the end of a line in which there were large spaces between the words. Without them, the book would be eight pages longer. As it is, I have increased the gutter by 5mm and reduced the length by 16 pages. Choosing different paper and editing out white space makes it almost 5mm thinner as well. I’m eagerly awaiting the proofs and hope to get my hands on the finished books well before the launch party on the Wibbly Wobbly (20 August 2012). Just drew the winner of the second free copy of Bokassa’s Last Apostle. The lucky winner is @EDITIONSDUFRIGO. I’m drawing another on Thursday, 26 August, 2012. So &helip; get busy and make friends on Facebook, use the ‘like’ buttons on this blog or re-tweet any of my tweets and EACH TIME you do you get another chance to win the third free copy on the 26th. Read the sample (there’s a like button at the bottom) by clicking on the book jacket or even click through and get the Kindle version and read it through to the end, if you just can’t wait until it appears in the bookshops! As the publication date for Bokassa’s Last Apostle approaches (20 August 2012) I have announced a promotional giveaway of TEN free copies of my book. For details, click on the YELLOW box in the menu panel to the right. I’ve decided that to make this more interesting, I’m going to turn this into TEN SEPARATE draws for one book each, spaced so the draws become more frequent as the 20th approaches. And I’ve awarded the first copy to @LGBTQNation on twitter. They were chosen by a random number generator on an excel spreadsheet. The next draw will be made at midnight on Saturday 21 July. I have made a new page with details of the ticket holders and draw dates etc. which is here. A very brief look at the list will make it perfectly clear that the overwhelming majority of tickets are as a result of follows on Twitter. Reading the rules you will see that ADDITIONAL TICKETS can be had for EVERY retweet, FRIEND request, LIKE on facebook and GOODREADS review. SO IF you REALLY REALLY want a better chance of getting your hands on a FREE copy of Bokassa’s Last Apostle, retweet a few of my tweets and go right to the front of the queue! Remember to continue following me on twitter or remaining friends on Facebook until the END of the promotion (20 August 2012) as I need to be able to contact you to send out your book.